If you’re looking for a durable, flexible and watertight event space then our stretch tent hire for festivals is ideal for you. An exciting alternative to the traditional marquee, our stretch tents can create a funky, flexible and memorable backdrop for your festival. Whether you’re looking for a small bar tent, breakout space or VIP venue, or a huge event space to hold your headline acts. Our stretch tents can create the perfect place to party. Due to the flexible nature of freeform stretch tents, we can work around your needs. Accommodating soft ground, hard ground and even awkward spaces. Available in a range of sizes, from small bijou tents for compact spaces to large or combined tents that can hold hundreds or even thousands of guests. Stretch tents are limitless in their applications. Making them the ideal solution for your festival, no matter how large or small. Do you want to make your tent truly stand out? Then our custom branding is the solution for you. Customise your stretch tent in any colour, add your logos or get a completely bespoke branded stretch tent in any design. Why Choose CGSM For Your Festival? If you want your festival to be a success then you need a stretch tent supplier you can trust to deliver. With over 10 years in the industry, we’ve supplied stretch tents to festivals throughout the UK. Our tents are high-quality, robust and designed to withstand almost all weather conditions. Making them perfect for the UK festival scene. Strong, Durable & Waterproof – Designed to withstand most conditions our stretch tents will make sure the party keeps going even in wet weather. Punctual, Reliable & Professional – We’ll show up on time and provide you with excellent service and a quality space for your event. We Keep Things Simple – Simple contracts, responsive staff and hassle-free service that makes organising your festival easy. Custom Branding – Customise your stretch tents in any colours, add your branding or logos and make your tent truly stand out. Over the last 10 years we’ve established ourselves as one of the UK’s leading and most innovative stretch tent hire companies. 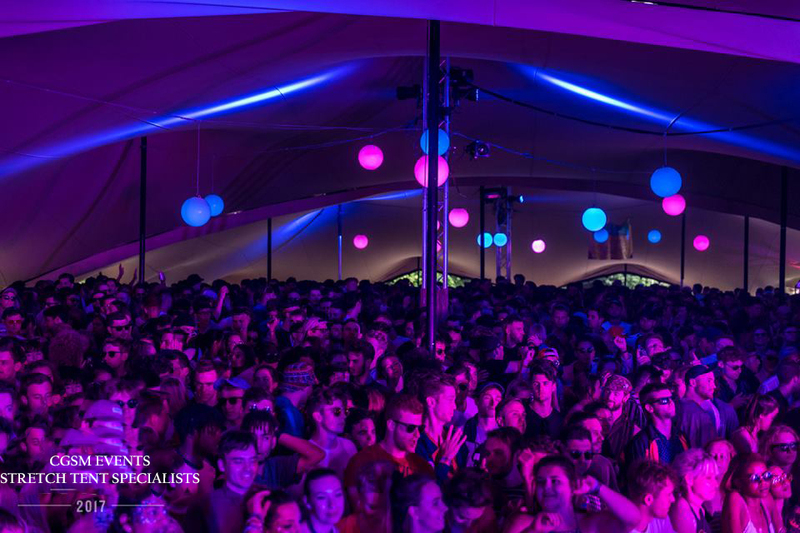 We’ve provided our high quality stretch tent solutions to festivals all throughout the UK. Check out our case studies below and get in touch to find out how we can help create a magical space for your next festival. We were approached by a well-known festival in the south-west to install a 20x30m stretch tent in their chill out zone. The weather was not kind and the site was extremely muddy and inaccessible. We had to find solutions to get 1.5 tonnes of kit from the nearest access point to the chill out zone and erect the tent in torrential conditions. All without the stretch tent getting muddy or marked in any way. We created slide boards out of MDF and fixed ropes of the front and the rigging team pulled them the 200m to the site. The tent was erected on time and unmarked for the client to install the interiors. We even used the ‘sled-boards’ to help the client move their gear into the tent at the end of the day. We are that sort of company. We are regularly asked by clients to supply ‘bar tents’ at festivals. Sometimes we supply everything they need as well as the stretch tent. We were asked by a wine bar company to create a series of bar spaces at their festival. We created three bar areas out of three of our 10x15m stretch tents with interiors. The challenge was to create something aesthetically pleasing inside as well as eye-catching outside. So we worked with them to create three unique spaces; one rustic, one LED and one Cocktail Bar Chic. The client had used marquee structures in previous years. Unfortunately, they had not had the revenue from the bars that they had hoped. Their first year at the festival saw a significant increase in their revenues.